The boho wedding look is all about creating a relaxed and carefree style, with light colours, floaty fabrics and big day decor that looks and feels totally effortless - even if it took hours! Think strings of fairy lights, unstructured flower displays and other natural elements, like feathers, hessian or crystals. And, of course, you need a bohemian wedding dress to match. Boho is often shorthand for a timeless, vintage look, but our Sussex design shows that you can be beautifully boho and bang on trend too! Here a stylish halter neck has been paired with a flattering draped bodice and skirt to give you the best of both worlds. The high neckline is offset by attractive, bare shoulders and the figure-flattering draped bodice, which is perfect for concealing any lumps and bumps. There’s also a matching chiffon belt, to cinch in your waist. It’s a look that’s simple but stunning. At the back there’s a gorgeous, lightweight chiffon bow that will flutter prettily behind you as you walk. Wear this with a delicate floral headband and our gently sparkling Leonie belt to highlight your waist. Our Willa veil, in classic plain tulle, is also beautifully boho and unfussy. The flowing chiffon really comes into its own with the softly draped skirt. Just imagine wearing this while walking barefoot across the sand towards your sweetheart! And, if you want this look but would prefer something with classic straps, then take a look at Blair. Alternatively, Millicent, with its full-length sleeves, or Paisley, with its illusion neckline, could be the one for you. This slim A-line bohemian wedding dress is oh-so romantic. 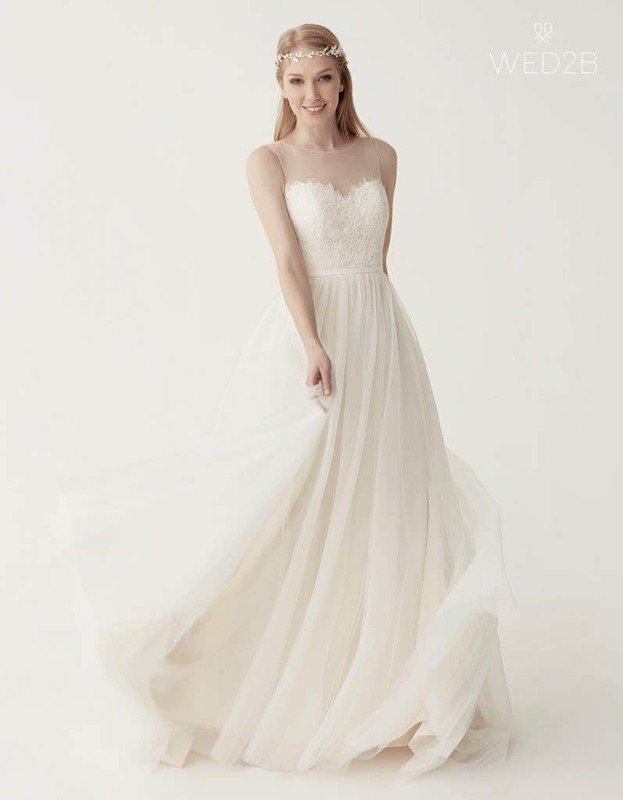 We love the exquisite lace, the soft illusion neckline and that beautiful floaty skirt. It’s just dreamy! The bodice is covered with intricate corded lace that’s finished with a pretty eyelash trim. At the waist there’s also a tiny, super pretty grosgrain ribbon, which ties in a bow at the back. You could add our Solstice belt too, for a little more sparkle! At the back the high illusion neckline offers gentle coverage and support around the striking row of covered buttons, which lead down to the pretty ribbon waist. This dress looks amazing worn with loosely flowing hair, accessorised with our Calli hair vine. It features sparkling crystals, pearls and leaves that are the perfect complement to any bohemian wedding dress. 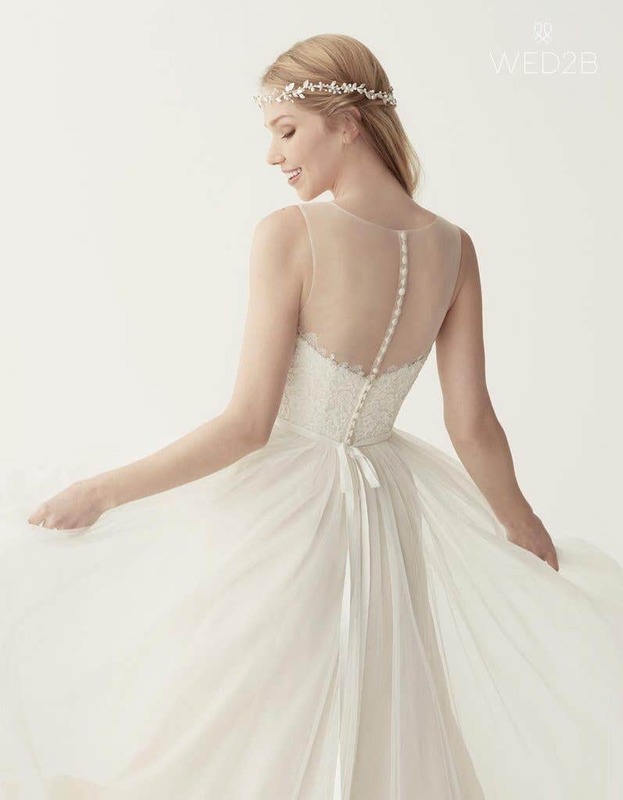 As you skip down that aisle like a boho princess, the super soft tulle skirt will float dreamily behind you, looking effortlessly chic. Did you know Thalia is available in shades of both ivory and champagne? So you can choose the perfect colour to suit your skin tone. Alternatively, if you like this style but would prefer a slightly different neckline, take a look at Sullivan instead.